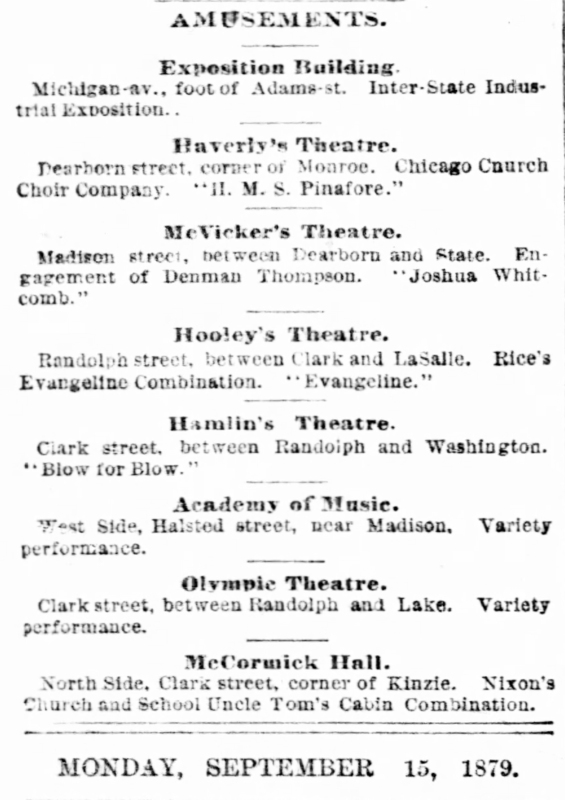 A Brief Chronicle and Abstract of the Theaters in Chicago from 1840-1900. There are ten theatres in Chicago, exclusive of dime museums and beer gardens. Seven of them are what would be called first-class. They rank thus : McVicker’s, the Haverly, Grand Opera House, Academy of Music (West side), Hooley’a, Standard and Lyceum. Of these, perhaps, Haverly’s is the more elegant. ACADEMY OF MUSC, Halsted Street, near Madison. Built by W. B. Clapp. Opened January 10, 1872, by the Wyndham Comedy Company in Ours. Lucille Western, Aimee, Chanfrau, Edwin Adams, the Vokes Family, Sothern, McCullough, Toole, Jefferson, and many other notables, played here during the period of rebuilding the city. Destroyed by fire February 4, 1878. Rebuilt and reopened September 15, 1879, by William Emmett as a dramatic and variety house. Again burnt out October 12, 1880. Rebuilt and reopened December zoth the same year by Stetson’s Neck and Neck. Dan Shelby assumed management in 1882; H. R. Jacobs in 1888, continuing until 1897; when E. P. Simpson became manager. THE NEW ADELPHI, afterwards Haverly’s. The walls of the old postoffice building, left standing after the great fire, on the corner of Dearborn and Monroe Streets, were utilized as the shell of a theater called by this name, and opened January 11, 1875, with burlesque, under the direction of Leonard Grover. Reconstructed in 1878, it was reopened by J. H. Haverly under the name of Haverly’s Theater, August 4, 1878, with the Colville Folly Company in The Babes in the Wood, and was used for general theatrical purposes until 1880, when demolished to make way for the First National Bank building. AIKEN’S THEATER (the Second). Built at the northwest corner of Wabash Avenue and Congress Street, and opened October 7, 1872, the anniversary of the big fire, with the Theodore Thomas orchestra. It was a failure, and after a time was rechristened the Adelphi, and conducted as a variety house by Leonard Grover. It burned in the second big fire, July 14, 1874, and was not rebuilt. The stock company organized for Aiken’s Theater included Frank Lawler, Milton Nobles, F. R. Pierce, George Reed, C. R. Graves, W. C. Crosbie, Charles Rogers, H. B. Howland, A. M. Clark, J. Cline, Miss Anna Lonergan, Miss Emma Maddern, Miss Ada Gilman, Mrs. Clara Maeder, Mrs. Charles Hill, Miss Mollie Maeder, Miss Belle Remick and others. The season was a total failure, and the company soon fell apart. THE ALHAMBRA, State Street and Archer Avenue, H. R. Jacobs, manager. Was dedicated September I, 1890, by the Emma Juch Grand English Opera Company in Faust. Mr. Jacobs retained the management until April, 1897, when W. H. Barry became manager and conducted the theater until June, 1898, when James S. Hutton of the Lincoln Theater obtained the lease and reopened the theater August, 1898. THE AUDITORIUM. Built by the Auditorium Association. Dedicated Monday evening, December 9, 1889, by a special programme, of which Adelina Patti was the bright particular star. Clarence Eddy, and the Apollo Club appeared, and there were addresses by Mayor Cregier, Hon. John S. Runnells, Ferd W. Peck and Governor Fifer. On the next evening the Abbey & Grau Company gave Romeo and Juliet, with Patti as Juliet, and Tamagno followed on the next night in William Tell. Milward Adams has managed this opera house, one of the greatest in the world, from the opening until the present time. THE BIJOU, formerly The Standard, corner of Jackson and Halsted Streets. Built by C J. Whitney, of Detroit. Opened December 31, 1883, by Fay Templeton in Girofle Girofla. Variously occupied until 1897, when it was renamed “The Bijou” and devoted to popular melodramas. BRYAN HALL, Clark Street, the site of present Grand Opera House, was built in I860, and devoted to concerts, conventions and miscellaneous entertainments. CENTRAL MUSIC HALL, corner of Kinzie and Clark streets. This hall replaced the short-lived McCormick Hall. CHICAGO OPERA HOUSE, corner Washington and Clark Streets. Opened August 18, 1885, by John W. Norton & Co., David Henderson, manager. The attraction being Tom Keene in Richard III. 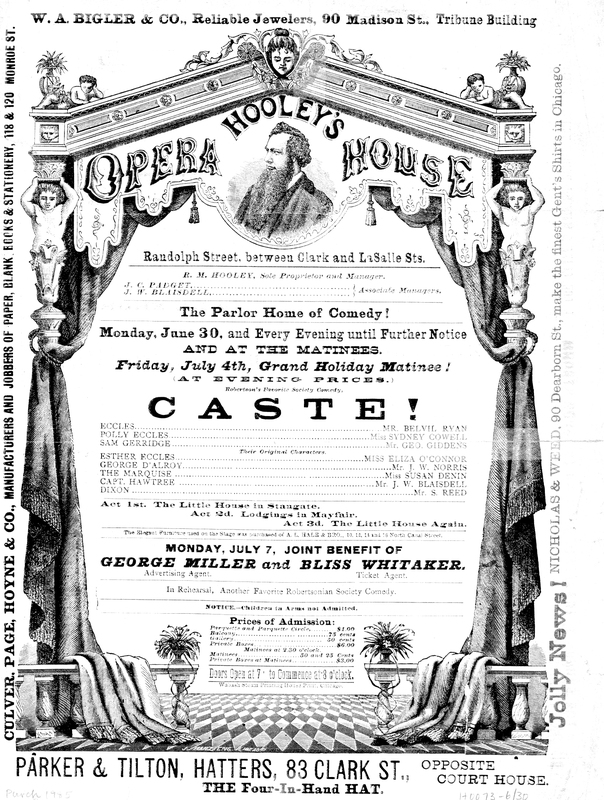 For a little more than ten years under the same management, the house was leased December 22, 1895, by Kohl & Castle, and devoted first to combinations and to continuous vaudeville. It was opened under this management by Eddy Foy in Little Robinson Crusoe. CLARK STREET THEATER, North Clark and Michigan Streets, opened October 27, 1889, by H. R. Jacobs, with Said Pasha by the California Opera Company. COLUMBIA THEATER, known for four years as Haverly’s Theater, south side of Monroe Street between Dearborn and Clark Streets. Managed by J. H. Haverly and then C. H. McConnell. Name changed to Columbia in 1885, during Irving engagement, Ellen Terry officiating at the ceremony. Reconstructed by J. D. Carson and reopened October I, 1888, by the Duff Comic Opera Company in the Queen’s Mate. Leased by Al. Hayman and W. J. Davis in 1890, and conducted by them since that time as a high class combination house. Their opening was with the County Fair, August 24, 1890, since which time the Columbia has become one of the most noted theaters in the United States. It was destroyed by a fire on 30 March 1900. CROSBY’S OPERA HOUSE. Finished in 1865 at a cost of $600,000, and opened April 2Oth by J. Graus Italian Opera Company in II Trovatore, Clara Louise Kellogg prima donna. The location was on the north side of Washington Street, between State and Dearborn. Refitted in 1871 at a cost of $80,000, and was to have reopened October 9th with the Theodore Thomas Orchestra, Maria Krebs pianist and Bernhard Listemann violinist, but was destroyed by the great fire on that date and never rebuilt. DEARBORN STREET THEATER (originally Aitken’s Theater, at 115 and 117 Dearborn Street), opened January 18, 1869, with a stock company in Cyril’s Success. Transformed into the Dearborn August, 1869, it was occupied by Emerson & Manning’s Minstrels, and subsequently by other attractions, including German opera, Charles Wyndham and other notable attractions. For the week of October 9, 1871, the Dearborn Minstrels had announced a burlesque on Love and War. The house was not rebuilt after the fire. FIRST ACADEMY OF MUSIC, 124 Washington Street, opened December I, 1863. Arlington, Kelly & Co.’s Minstrels. Afterwards Campbell & Castle’s English Opera. FIRST OLYMPIC, corner Clark and Monroe, July 13, 1868. Arlington’s Minstrels. THE GLOBE, Desplaines Street. Opened November 21, 1870, by a stock company in The Rivals. Subsequently John Dillon, Oliver Doud Byron and others played here. It was the only theater surviving the fire. GRAND OPERA HOUSE, on the site of Bryan Hall, Hooley’s Opera House, the Coliseum and Hamlin’s Theater. Rebuilt in its present form in 1880 by Wm. Borden at a cost of $55,000, and leased to J. H. Hamlin. Opened September, 1880, by Hoey & Hardy with “A Child of the State.” Continuously managed since that time by the Hamlins, and now owned by them. GREAT NORTHERN THEATER. Opened November 9, 1896, by A. M. Palmer, with Henry Miller in Heartsease. Subsequently managed by the Hopkins-Thayer Hight Company and David Henderson, the latter taking possession November, 1897, and relinquishing the house June 25, 1898. Reopened August 27, 1898, as a vaudeville house by Salisbury & Tate. HALSTED STREET OPERA HOUSE Located at the corner of Halsted and Harrison streets. Take South Halsted or Blue Island avenue car. This theatre is generally occupied by a stock company in sensational drama. HAVLIN’S THEATER,, formerly Baker’s, opened November 6, 1888, with “The Pearl of Pekin.” Leased to J. H. Havlin May 27, 1889, and the name changed to Havlin’s. The opening attraction under this management was May 27, 1889, with the first American production of Lecocq’s comic opera La Jolie Parisienne. After a number of years during which the theater was managed with great ability by James S. Hutton, Mr. Havlin relinquished the lease and the theater under various names was the scene of many failures. On August 15, 1898, the house was reopened by Will H. Barry, who changed the name to the New Adelphi. THE HAYMARKET, Madison Street near Halsted. The doors were thrown open under the management of William J. Davis, December 24, 1887, the attraction being Thomas Keene in Richard III. The house prospered greatly under this management for nearly ten years. Mr. Davis relinquishing the control December 5, 1896, when the theater passed under the control of Kohl & Castle, who have since devoted it to continuous vaudeville of the best class, with Jay Rial as the active manager. HERSHEY’S MUSIC HALL. Later known as Madison Hall and Sam T. Jack’s Burlesque House. This hall was located at 20-24 W. Madison and was five stories high. Torn down in 1905. HOOLEY’S THEATER. Built on Randolph Street site and opened October 17, 1872, with the Abbott-Kiralfy Company. Was the second down-town theater opened after the fire. In 1876 and ’77 it was known as Haverly’s, and then restored to the firm of Hooley & Quinlan, and subsequently to R. M. Hooley, who was exclusive manager up to the time of his death, September, 1893. May I, 1898, passed from the control of the Hooley estate on a ten-years’ lease to Harry J. Powers, who was forbidden to use the name of Hooley except for an extraordinary and prohibitive bonus, and consequently, under the advice of friends, changed the name to Powers’ Theater, and opened under that name after complete reconstruction August 22, 1898, with Clyde Fitch’s play The Moth and the Flame, played by Herbert Kelcey and Effie Shannon. HOPKINS’ THEATER, formerly the People’s, was built by Jonathan Clark and opened by Joseph Bayliss, October I, 1884, with Robert Graham in Wanted a Partner. After some years the house fell into disuse despite the efforts of various managers to revive it. In 1894 it was leased by the Tri- State Amusement Company, and opened as Hopkins’ Theater under the immediate management of Col. J. H. Hopkins, who catered drama and vaudeville in a most successful manner. September 4, 1898, Hopkins became sole lessee, and reopened with Trilby, given by his regular stock company. THE IROQUOIS, was located at 24–28 West Randolph Street, on the North Side between State Street and Dearborn Street in Chicago. The syndicate that bankrolled its construction chose the location specifically to attract women on day trips from out of town who, it was thought, would be more comfortable attending a theatre located close to the safe, police-patrolled Loop shopping district. The theatre opened in November 1903 after numerous delays due to labor unrest and, according to one writer, the unexplained inability of architect Benjamin Marshall to complete required drawings on time. Upon opening it was lauded by drama critics; Walter K. Hill wrote in the New York Clipper (a predecessor of Variety) that the Iroquois was “the most beautiful … in Chicago, and competent judges state that few theaters in America can rival its architectural perfections. Then there was The Fire. McVICKER’s THEATER. James H. McVicker built his first theater upon the spot ever since identified with his name in 1857, at a cost of $85,000. It was opened November 5, 1857, by a stock company in The Honeymoon and The Rough Diamond. Edwin Booth first appeared here May 31, 1858, playing “A New Way to Pay Old Debts,” followed by Richelieu, Brutus and Richard III. Sothern first appeared herein 1861. J. H. Hackett, 1863. Lotta, 1864. Charles Kean, 1865. Mrs. Siddons, 1869, and other noted actors of the day at intervals. The theater was rebuilt in 1871, after having been remodeled in 1864, at a cost of $90,000, and reopened August 29 with Extremes. A play called Elfia was running when the house was destroyed in the great fire of October 9, 1871. The theater was rebuilt at a cost of $200,000 and reopened August 15, 1872, with Douglas Jerrold’s Time Works Wonders. This building served until 1885, when it was remodeled at a cost of $145,000. It was destroyed by fire August 26, 1890, during the run of Shenandoah, and when rebuilt was reopened March 31, 1892, with the Jefferson-Florence Company in The Rivals. The lease of the theater fell to Jacob Litt, May I, 1898, for a term of ten years. MYERS’ OPERA HOUSE. In the building on Monroe Street, long identified with Chapin & Gore, Samuel Myers, formerly connected with McVicker, constructed a theater which was opened September 23, 1872, and devoted for some years chiefly to minstrelsy. Nearly all the prominent minstrels played there during the few years that this house was in existence. NATIONAL THEATER, south side of Monroe near Wells. At first North’s Amphitheater opened in 1856 with a stock company, including Mr. and Mrs. E. Thorne, L. Mestayer and W. F. Johnson. Subsequently J. H. Wallack, Dion Boucicault, Agnes Robertson, Maggie Mitchell, and the comedian Burton appeared at this house, which fell into decay in 1859, and in 1864 was demolished to make room for a business block. NEW WINDSOR THEATRE—Clark and Division Streets, was opened September 26, 1886, under the management of Philip H. Lehnen, with the Redmond-Barry Company in A Cure for the Blues. Burned April, 1889. Rebuilt and reopened October, 1889, under the direction of M. B. Leavitt. Leased to James S. Hutton, August 26, 1894, and name changed to Lincoln Theater, the opening attraction being Gustave Frohman’s Charity Ball Company. Burned again December, 1898. This is a beautiful little theatre, is conducted in a first-class manner and is very popular with North Side residents. THE OLYMPIC THEATER, formerly the New Chicago, built upon the site of old Kingsbury Hall. Reconstructed and reopened under the management of J. H. McVicker, August, 1875, Thos. A. Hall managing, with a stock company including Louis James, Thomas Whiffen, Harry Lee, W. B. Chippendale, Helen Tracy and Ada Oilman. The opening play was Apple Blossoms, but the venture was not successful. The house was devoted to various uses until it was leased May, 1885, to Kohl & Middleton, who called it the New Olympic, opened with Laura Dainty in A Mountain Pink, and have conducted it ever since as a variety house, with George Castle as manager. In 1896 the house was rebuilt. RICE’S FIRST THEATER. The real beginning of theatrical history in Chicago was made by J. B. Rice, who erected and dedicated, June 28, 1847, the first theater building constructed in Chicago. It was erected on the south side of Randolph Street, 50 feet east of Dearborn, and was opened by a stock company, in The Four Sisters. The company included Mrs. Hunt, afterwards Mrs. John Drew, Mr. and Mrs. J. B. Rice and Dan Marble. On May 2, 1848, J. H. McVicker made his first appearance, the farce being My Neighbor’s Wife.” Edwin Forrest and Junius Brutus Booth were among the attractions of that year. The theater burned July 30, 1850, during a performance of La Somnambula, and it is stated that Mr. McVicker was on the stage when the alarm was given. RICE’S SECOND THEATER. On February 3, 1851, Mr. Rice opened his second theater, which was built of brick at a cost of $11,000, on Dearborn Street, between Randolph and Washington. With a frontage of 80 feet and many improvements and conveniences, it was regarded as a great step in advance and was destined to be the home of the drama in Chicago for six years, during which period all the important stars of that early day visited the city, which at that time boasted a population of less than 5,000 souls. The theater was opened on the evening already mentioned. The stock company joined first in singing the Star Spangled Banner and then presented a triple bill: Love in Humble Life, Captain of the Watch, and The Dumb Belle. It was transformed into a business house in 1861, having outlived its usefulness by several years. SCHILLER THEATER (now Dearborn). Built by the German Opera House Company, and opened under the direction of Anson Temple, October 17, 1892, by Charles Frohman’s Company in Gloriana. Subsequently managed by Thos. W. Prior, Ira J. La Motte, David Henderson, Robert Blei, R. C. Gardner, E. L. Webster, Geo. A. Fair and Gustav Luders. September 4, 1898, this theater was rechristened The Dearborn by the Tri-State Amusement Company, and reopened under the business management of J. J. Brady, with a stock company in Too Much Johnson, supplemented by vaudeville. WOOD’S MUSEUM, at first Aiken’s, 111-117 Randolph Street, Kingsbury Hall site. Opened August 17, 1863, with curiosities. November, 1863, the new stage was dedicated by the Holman Opera Company in the Bohemian Girl. The Lady of Lyons was the first play, given in December. When burned in 1871 Divorce was running. Was bought by C. J. H. Wood, January, 1864. A stock company was organized at this house in 1869, including McKee Rankin, M. V. Lingham, J. W. Jennings, A. D. Bradley, J. D. Germon, May Howard, Katy Fletcher and Anna Marble.